Jacob Bass is joined by his father Jaye , mother Janice, grandmother Jackie, grandfather Jerry and his brother and sister during Newberry College Baseball Scholarship ceremony Tuesday morning. 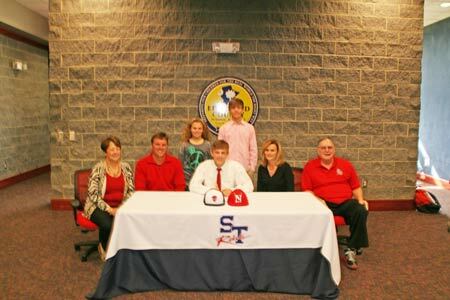 Strom Thurmond senior Jacob Bass signed Tuesday morning to play baseball for Newberry College. Young Mr. Bass stated that he decided to sign with Newberry mainly because he really likes the baseball coach. The baseball coach at Newberry College is Coach and Mrs. Dusty Triplett’s son Russell Triplett. Jacob was joined by his parents Jaye and Janice as well as his grandparents Jerry and Jackie Bass, for the official signing. The Thurmond shortstop finished last season with a 400 batting average even though he was nursing an injury all season. With the injury all taken care of he is now ready to work hard and get some playing time as a freshman for the Wolves. Also in attendance were his Thurmond coaches, Head Coach Chris Zylstra and assistant coach Greg Yonce along with numerous teammates and other family members. Jacob will be joining players that he has played the game with from other high schools at Newberry next year as he fulfils his wish to play at the college level.